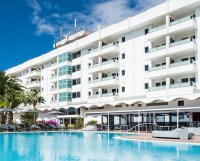 The famous international gay resort in Gran Canaria. 23 one-bedroomed bungalows for 1-3 people and 6 2/3 bedroom villas set in beautiful tropical gardens near to the Dunes and Yumbo Centre. Set in lush tropical gardens with two superb swimming pools and its own restaurant and bar Villas Blancas provides guests with the very best in exclusively gay male accommodation. Offering studio and one bedroom Bungalows, two and three bedroom Villas, there is a choice of accommodation to suit everybody. Single, with your partner, or with a group of friends Villas Blancas offers you the best choice to spend a superb holiday or short break at one of Europe's best gay destinations. 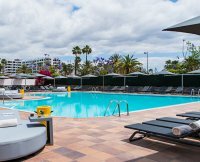 AxelBeach Maspalomas offers free Wi-fi connection in the public areas as well as car and bike rental service. The one and only gay resort renowned for its style since 1998, in tropical-modern decoration, immersed in lush tropical gardens, in an area where the surroundings are green and the atmosphere is exotic, yet only 5 minutes drive in our Free Shuttle from the Yumbo Center and the Dunes... One of the very few resorts in Gran Canaria constantly on the market for such a long time thanks to constant renovation, satifaction of our guests and dedication of our staff.. Luxury Private Villa with Solar Heated Pool in Gran Canaria. A newly built 3 bed-roomed villa with its own private pool situated 15 minutes from the airport in the exclusive area of San Agustin, Masplaomas. The villa is just a short walk from all local facilities, which include three supermarkets, restaurants, car rental, bus stops and taxi services. The small bay of San Agustin provides a safe beach with calm waters and is reached by strolling to the end of the road.San Agustin is mostly residential and is therefore quieter than Playa Del Ingles and Puerto Rico affording you the opportunity of a very relaxing environment in which to spend your holiday.